I came up with a super easy, cheap, and fast Halloween articulation activity. There's not much to it, but if you are out of time / too lazy to prepare something more extravagant, this last-minute activity may be for you. I needed a quick Halloween-themed thing for my next artic group. I simply placed a parchment paper template (check TPT, Google images) and placed it into a word doc. 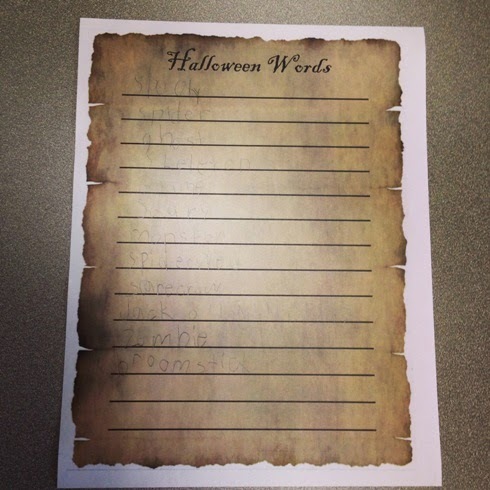 I placed a table with hidden borders over it to create lines on the paper and put the title "Halloween Words" on top (I found that the Blackadder ITC font that comes with Microsoft Word looks pretty Halloween-ish). I then printed out a copy for each student. When the students came in, I asked them to brainstorm as many words with their target sound that have to do with Halloween. My s/z group had a lot of fun trying to fill up their lists. We then practiced the words from this list. This is a great activity to help younger students increase their awareness of their targets within words. I almost felt guilty because this was so easy! Playroom Entertainment Game Review: Saddle Up!